Dizziness is commonly described as a feeling of light-headedness, unsteadiness and the feeling that you are about to faint. Dizziness is also commonly associated with the feeling that you or your surroundings seem to rotate endlessly. Such type of dizziness is medically referred to as ‘vertigo’. Dizziness essentially shakes the balance of the individual. The sense of balance depends on a variety of information processed by the brain after receiving inputs from eyes, inner ears and the nervous system. Loss of balance or feeling dizzy is experienced in the event of signals sent to the brain not being processed due to contradiction in messages or mal- function in sensory systems. Dizziness is among the most common complaints after backache to be experienced by a large majority of people especially older adults. There are various causes that lead to dizziness. Dizziness can be a single short experience or lead to occasional or frequent spells. Though it is not a serious disorder it is important to diagnose the cause and eliminate the reason. Dizziness is a condition that refers to impairment in spatial perception, a severe compromise of stability and is evident with symptoms of light-headedness, feeling faint, being unsteady and loss of balance. Dizziness often occurs when your brain does not receive adequate blood and can also be caused by a sudden drop in your blood pressure or even dehydration often brought on by bouts of vomiting, diarrhea or fever and is sometimes known to be caused by factors like the flu, hypoglycemia, common cold and common allergies. Severe headaches and dizziness also often accompany each other. Dizziness treatment is therefore not always necessary and depends on the dizziness symptoms and causes as the causes of dizziness and lightheadedness can vary greatly. Dizziness is often used to describe various ailments like vertigo, presyncope or disequilibrium. • Vertigo is used to describe a state wherein the person experiences a spinning sensation and is often seen along with other side effects like nausea and vomiting. The person experiences a feeling of being in motion while in reality they are stationary. Vertigo is often caused by factors like benign paroxysmal positional vertigo, vestibular migraine, Ménière's disease and even vestibular neuritis. Excessive consumption of alcoholic beverages is also known to cause certain symptoms associated with vertigo. Vertigo is broadly classified into peripheral or central as per its origin and nature. Peripheral vertigo is associated with an imbalance in the inner ear and vestibular system while central vertigo is mainly associated with the balance centers of the brain and is also known to be milder in comparison with the latter. Dizziness and vertigo causes severe headaches and the treatment or cure would depend mainly on the symptoms. It isn’t uncommon to find disorders of the inner ear causing dizziness. • Disequilibrium is associated with the feeling of being off balance. Equilibrioception is the physiological sense of balance found in animals and humans which prevents them from losing their balance when standing still or even walking. 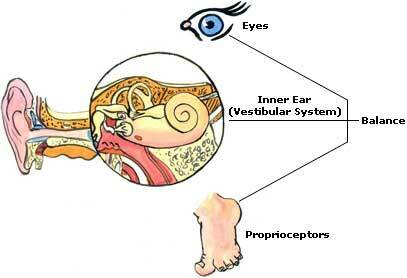 Equilibrioception is mainly sensed by the vestibular system detecting any kind of acceleration. This sense of balance is known to degrade with age but can be greatly enhanced or improved with some kind of special training. • Pre-syncope is a state wherein the person experiences sensations of lightheadedness and muscular weakness, as opposed to a syncope, wherein the person actually faints. Pre-syncope is mostly cardiovascular and does not arise from the central nervous system or the inner ear as with the other disorders. This is often a symptom of orthostatic hypotension which results in the sudden drop of blood pressure from the sudden standing of a patient and may be even more pronounced after resting. If under these conditions, loss of consciousness occurs, then it is termed syncope. There are many other conditions also associated with sudden dizziness and they can be broken down into categories as follows: 40% peripheral vestibular dysfunction, 10% central nervous system lesion, 15% psychiatric disorder, 25% presyncope/dysequilibrium, and 10% nonspecific dizziness. Conditions like benign paroxysmal positional vertigo, Meniere's disease, Vestibular neuronitis, Labyrinthitis, Otitis media, Acoustic neuroma, chronic motion sickness, Ramsay Hunt syndrome, migraine, low blood pressure or low blood oxygen, Multiple sclerosis or hyperventilation. Certain hormonal changes such as thyroid disease, menstruation or pregnancy are also known to cause spells of dizziness. It is also brought about by age-diminished visual, balance, and perception of spatial orientation abilities. Dizziness and nausea are not always indicative of serious health concerns and often occur during pregnancy, during menstrual periods, in the mornings, when standing up and also during exercise. Dizziness symptoms during pregnancy are quite common and don’t really require any treatment as the symptoms are typical of morning sickness and will resolve by the third trimester. Dizziness treatment is not always necessary and depends on the dizziness symptoms and causes as the causes of dizziness and lightheadedness can vary greatly. Common causes of dizziness are low blood sugar and cardiac problems. In the case of low blood sugar, it is advisable to immediately consume non-carbonated syrups. Plenty of fluids like coconut water, fresh lime water with sugar and fruit juices is recommended to raise the blood sugar levels as is glucose. Gingerroot capsules also known to work in providing certain amount of relief, similarly black tea mixed with crushed ginger helps relieve the disorientation and nausea. Likely substitutions of ginger can be chamomile or even peppermint. Pregnancy related dizziness can be soothed by mixing two teaspoons of wheat germ into lukewarm milk, this is known to help ease the pain of morning sickness. Vitamin A and C rich fruits like Indian gooseberry is said to help. To consume, soak about five grams of the fruit overnight with coriander seeds. Consume the water after straining out the residue. Sweeten with sugar if found to be bitter. For anemic related dizziness, special attention needs to be paid to the diet of the patient. Iron, folic acid and vitamin B12 are needed to be focused on and be ingested in sufficient quantities. Iron can be found in many commonly available foods like fish, poultry and lean meats and even dairy products. Green leafy vegetables are rich in folic acid and are also highly recommended. Care must be taken to prevent dizziness and the following steps can be practiced to help control the onset of the same. Consumption of caffeine and alcohol should be kept to a minimum are they are known to cause dizziness in some people. One should reduce the amount of intake of salty nuts and especially sweet treats as the measure depending on how severe the symptoms are. Consumption of diet drinks is often associated with the feeling of dizziness and should be kept to a bare minimum or avoided altogether. This alone is considered as one of the most effective diets for dizziness. All the cures and remedies prescribed above are effective to the extent where the symptoms being experienced are not indication or are impending bigger disease If the symptoms of dizziness persist for long periods or are frequent immediately consult a health care professional. It is important to drink ample water, a minimum of 8-12 glasses of water to ensure blood pressure doesn’t drop due to exercise, high stress activities or due to a hot climate.